Partner Participant： Bando Manufacturing (Thailand) Ltd.
By introducing a new high-efficiency boiler and changing fuel of current flue and smoke tube boilers in rubber belt plant, this project reduces energy consumption and CO2 emission. 1)Introduce a “One-Through Boiler “ with 98% high efficiency. 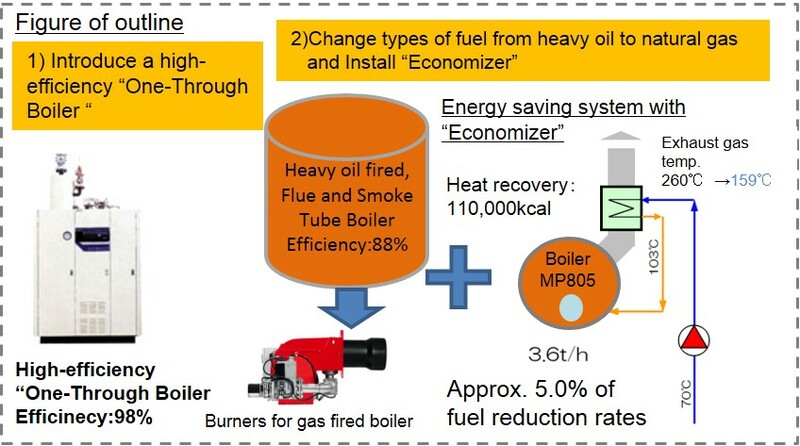 2)Change boiler fuel types from heavy oil to natural gas which has smaller CO2 emission factor and increase efficiency from 88% to 93% by adding “Economizer” to current three boilers.